Understanding the diversity of life starts with uncovering the evolutionary histories and relationships between interacting organisms and landscapes. As a botanist, I am fascinated by the rich diversity of flowering plants (angiosperms) and the insects that interact with them - both pollinators and antagonists (herbivores, seed predators, etc.) - and how these interactions may help explain the great diversity we see today. Much of my work focuses on differences between hawkmoth- and bee-pollinated plant species and the implications for floral phenotypes (shape, color, size, scent), population connectivity, and species boundaries. I'm also fascinated by the role that antagonists may play, especially those that are attracted to the same floral cues that attract pollinators (including color and scent) given the opposing, negative impacts of floral antagonists on plant fitness. Much of this work uses the Geographic Mosaic Theory of Coevolution as a model to explain the evolutionary relationships between members of the evening primrose family, Onagraceae, their hawkmoth and bee pollinators, and antagonist microlepidoptera in the genus Mompha (more info here). I am also committed to plant conservation efforts, including investigating the impacts of anthropogenic factors on plants and pollinators. My previous work has investigated the impact of land use change on an endemic, hawkmoth-pollinated evening primrose, Oenothera harringtonii and the role that atmospheric nitrogen deposition may have played in the decline of the nitrogen-fixing legume, Desmodium cuspidatum. ​Congrats to Kat Andrews who successfully defended her Master's thesis on March 1st! Krissa is 1 of 95 women in STEMM selected to participate in the 4th Homeward Bound cohort, TeamHB4! 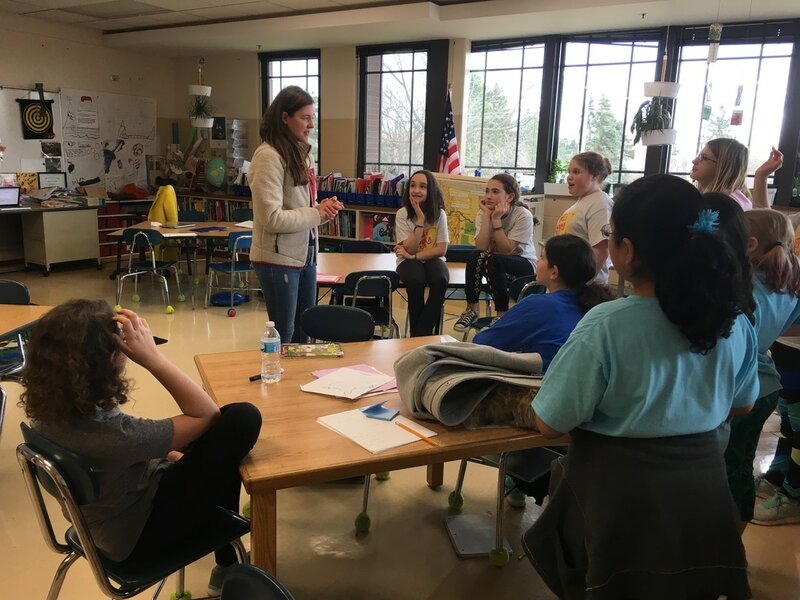 Homeward Bound is working to advance initiatives focused on women in STEMM, raise awareness about climate change threats, and train 1000 women in 10 years to pursue leadership positions to influence policy and decision making as it impacts the planet. The Program involves 11 months of leadership training and professional development and culminates in a 3-week voyage to Antarctica in Nov 2019! Congrats To Dr. Kelly Ksiazek-Mikenas Who Has Accepted A Full-Time Lecturer Position In The Biology Department At Elmhurst College Starting This Fall!! We're So Happy And Proud Of Her!! Krissa Was Featured On The 4th Episode Of The New Podcast, The Shape Of The World - Ep. 4 Secret In The Scented Night! ​Krissa worked with Chicago-area poet José Olivarez to create and perform a series of three poems inspired by her research on hawkmoth pollination and José’s poetry at the U.S. premier performance project, Experimental Words, from Manchester, U.K.-based scientist Sam Illingworth, Ph.D., and poet Dan Simpson. Read our poems! See the performance! ​Congrats to Susan Deans and Katie Wenzel on being awarded PBC Graduate Research grants to fund their 2018 fieldwork! Katie also received funding from the Illinois Native Plant Society! 12/14 - Congratulations to Dr. Kelly Ksiazek-Mikenas for submitting her doctoral dissertation and her great public defense talk of her work! We are very proud of Dr. Ksiazek-Mikenas and her many accomplishments!! 6/29 - REU student Melissa Vergara was awarded the 'PLANTS - Best Poster' award at the Botanical Society of America meeting in Fort Worth, Texas for her research titled 'Do herbivores prefer flower buds over leaves? Evaluating caterpillar preferences in evening primroses (Onagraceae).' Great job, Melissa!! 5/25 - CONGRATULATIONS to the newly-minted Dr!! Kelly Ksiazek-Mikenas has successfully defended her dissertation, titled 'The potential of green roofs to provide habitat for native plant conservation!! 4/12 - New paper in Molecular Ecology! The 2nd paper from Matt Rhode's Master's thesis! 3/17 - We are thrilled to announce that Katie Wenzell has been awarded a NSF GRFP for her proposal "Evolutionary landscapes: Gene flow and phenotypic divergence in ecological speciation"!! Way to go Katie!!! 3/15 - Congratulations to Katie Wenzell! Katie has recently received 2 grants for her Ph.D. research - from the Plant Biology and Conservation Program titled 'Geographic variation in floral traits and pollinators in relation to population genetic structure of two Castilleja species (Orobanchaceae)' and from the Friends of the Nachusa Grasslands titled 'Pollination ecology and genetics of downy painted cup in Illinois'. 3/10 - Congratulations to Kat Andrews who has been awarded a Plant Biology and Conservation research award for her proposal titled "Do drought conditions negatively impact Oenothera harringtonii fitness? 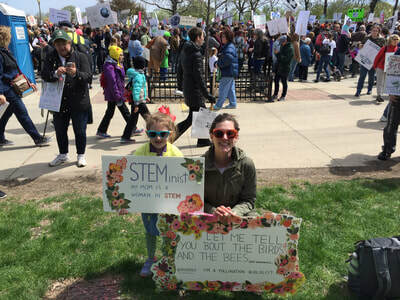 Changing floral traits impacting pollination and herbivory"
2/7 and 3/7 - Krissa was the STEM Scientist for the day as part of Sisters4Science through Project Exploration at Woodson North Middle School and Funston Elementary School in Chicago. Sisters4Science is an after school program for young girls from underrepresented communities in Chicago elementary and middle schools. Each session is led by a female scientist who emphasize leadership development through scientific exploration. 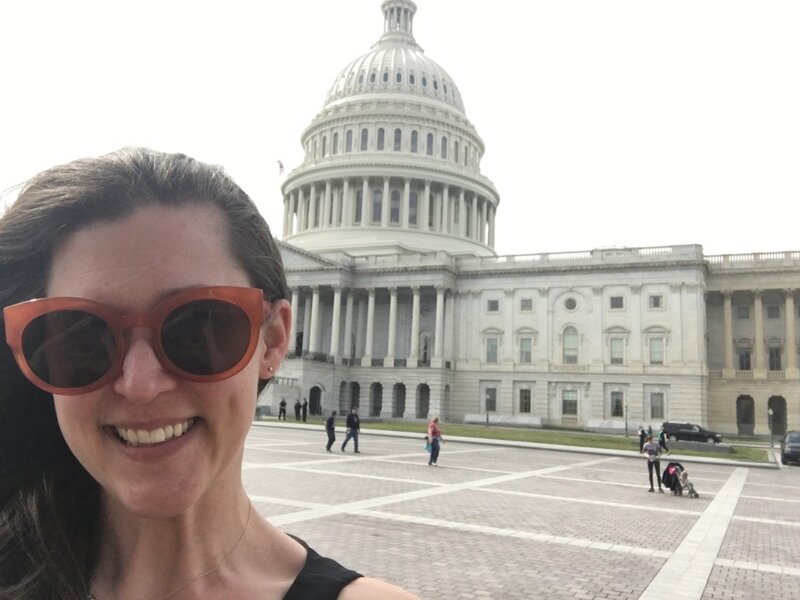 3/1 - Krissa meet with staffers on Capitol Hill to support federal funding for science funding and the new Botany Bill - H. R. 1054: Botanical Sciences and Native Plant Materials Research, Restoration, and Promotion Act. Visit the Plant Conservation Alliance page to learn more about the Bill and to how you can help move it forward. Herbivores, floral trait evolution and pollinator shifts! Check out our new paper in AoB Plants! Open Access!! Jogesh, T., R. P. Overson, R. Raguso, and K. A. Skogen. 2016. Herbivory as an important selective force in the evolution of floral traits and pollinator shifts in a clade of evening primroses, Oenothera sect. Calylophus (Onagraceae). AoB Plants. Our latest paper is now out in AJB! AND Open Access!! Skogen, K., T. Jogesh, E. Hilpman, S. Todd, M. Rhodes, S. Still and J. Fant. 2016. Land-use change has no detectable effect on reproduction of a disturbance-adapted, hawkmoth-pollinated plant species. American Journal of Botany. 103(11):1950-1963. 11/2 - Our paper on land-use change and hawkmoth pollination is now available online ahead of the November issue of the American Journal of Botany! Open Access!! Skogen, k., T. Jogesh, E. Hilpman, S. Todd, M. Rhodes, S. Still, and J. Fant. 2016. Land-use change has no detectable effect on reproduction of a disturbance-adapted, hawkmoth-pollinated plant species. American Journal of Botany. 103(11):1-14. 9/15 - The Skogen Lab welcomes 2 new graduate students - Rinnine Rodenius (PhD student) and Kat Andrews (Master's student)! 9/6 - Ben Cooper successfully defended his Master's thesis titled "Revealing patterns of evolution in a recently radiated plant group, the Sundrops (Oenothera Section Calylophus: Onagraceae) using target enrichment". Congrats Ben!! 8/19 - Congratulations to Amanda Patsis (Amherst College, 2017) who was awarded 'best in show' at the 2016 REU Research Symposium for her poster on her undergraduate honors thesis research, titled "Reconstructing the evolutionary history of Oenothera sec. Pachylophus". 11/6 - Congratulations to Emily Lewis who successfully defended her Master's thesis titled "Differences in population genetic structure of hawkmoth- and bee-pollinated species of Oenothera (Onagraceae) are more pronounced at a landscape scale"
8/14 - Evan Levy (2015 Dimensions REU - Colorado College, 2016) was awarded 'best in show' for the poster on his REU project titled "Floral preference of bees in a montane meadow in Flagstaff, AZ". 4/13 - Taylor Tate (Northwestern University, 2017) has received a Northwestern University Undergraduate Research Grant to study pollination and pollen tube growth in evening primroses during the summer of 2015. Congrats, Taylor! 4/8 - Congratulations to Ben Cooper (NU/CBG Ms, 2016), who's been awarded the Society of Herbarium Curators Student Research Grant for his work on the systematics of Oenothera section Calylophus (Onagraceae)! 4/1 - Ben Cooper and Dan Bruzesse (both NU/CBG Ms students, 2016) have been awarded graduate research grants from the Plant Biology and Conservation Program at NU - Congrats Ben!! 2/6 - Kelly Ksiazek (NU/CBG PhD student, 2016) has been awarded Northwestern's top honor, Presidential Fellow! Congratulations, Kelly!! Chicago Botanic Garden, 1000 Lake Cook Road, Glencoe, IL 60022.